As we have learnt, about mixture earlier. A porous material such as filter paper can be used to separate an insoluble dilute from the solution. For example, A suspension of chalk (CaCO3) powder in water can be separated by passing the mixture through filter paper. 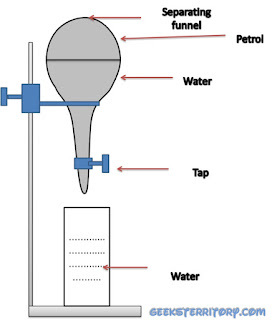 During the process, water molecules pass through the filter paper and it is collected as a filtrate in the beaker leaving behind the chalk powder on the filter paper as a residue. This method can be used in water purification plant etc. A) Sieving: This is a separation process, whereby a sieve is used to separate unwanted materials of different particle sizes. It is used to recover a dilute from its solution by vaporising. A salt solution can be separated by using evaporation method to dryness. During the process, a solution of salt is placed on a water bath to attain constant temperature. After a couple of minutes, the solvent turns to vapour and it is lost to the atmosphere. Leaving behind the salt in evaporation dish. Note: This method can only be used for salt that can not be easily decomposed on heating. 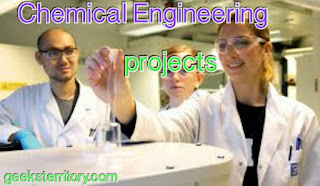 It is generally used in salt industry and many other industries. 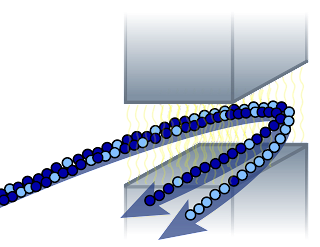 This is a process whereby solid substances turn directly into vapour without passing through an intermediate liquid state. Examples of this substances are: Ammonium chloride (NH4CL), Iodine (I), camphor (C10H6O) etc. Learn how to write Salts with Elements, Radicals and valence number. It is used to separate a mixture of sublime substance and non-substance substances. 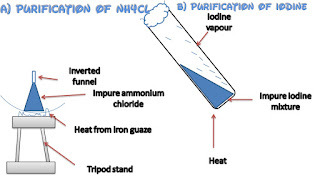 For Instance, a mixture of ammonium chloride (NH4CL) and sodium chloride can be separated by using sublimation method. A centrifuge is a machine used to spin test tubes containing suspension at high speed. The spinning causes heavy particles in the suspension to settle at the bottom of the test tube while the clear upper layer is decanted. 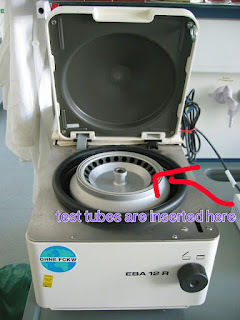 This is widely used in quality and testing labs, it can used in hospitals to separate blood samples for its suspension. Distillation is a technique used to separate liquid or gas mixtures into different fractions of desired purity by the application of removal of heat. It is used to recover a solvent component from a solution. 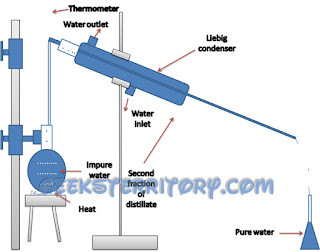 This process can simply be experimented by placing a round bottom flask containing solution where it is heated to vapourise the solvent, the vapour is then passed through a lie big condenser, where it cools and condenses into liquid and this is later collected in a receiver. The solute and other impurities are left in the flask. This method is applied in gin distilleries, water distilleries etc. This method is used to separate a mixture of two miscible liquids with different boiling point. 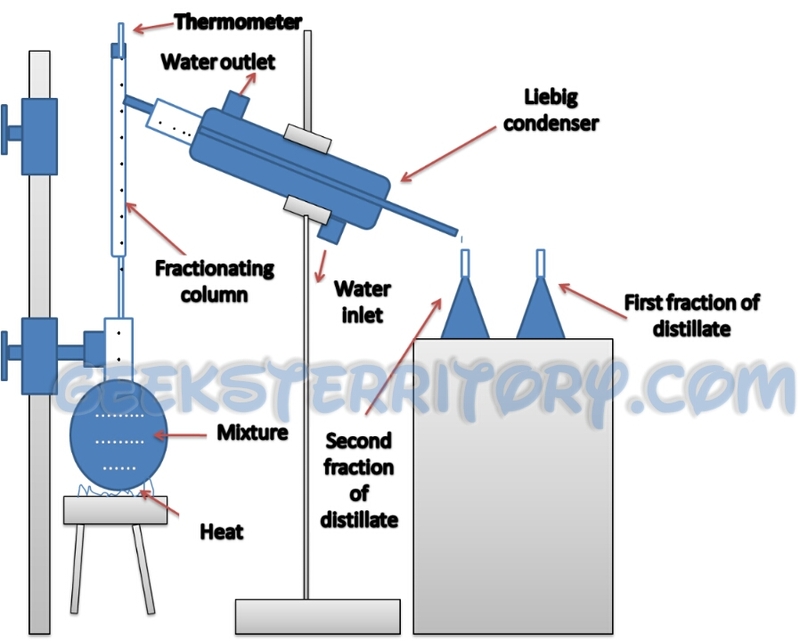 Note: for fractional distillation to be effective, the differences in boiling point must be greater than 10 degrees Celsius. Example of the Mixtures that can be separated by this method are: a mixture of ethanol and water, crude oil fractions etc . During this process, a liquid with lower boiling point distilled over first leaving behind other liquid which are still within the limit of their boiling point. 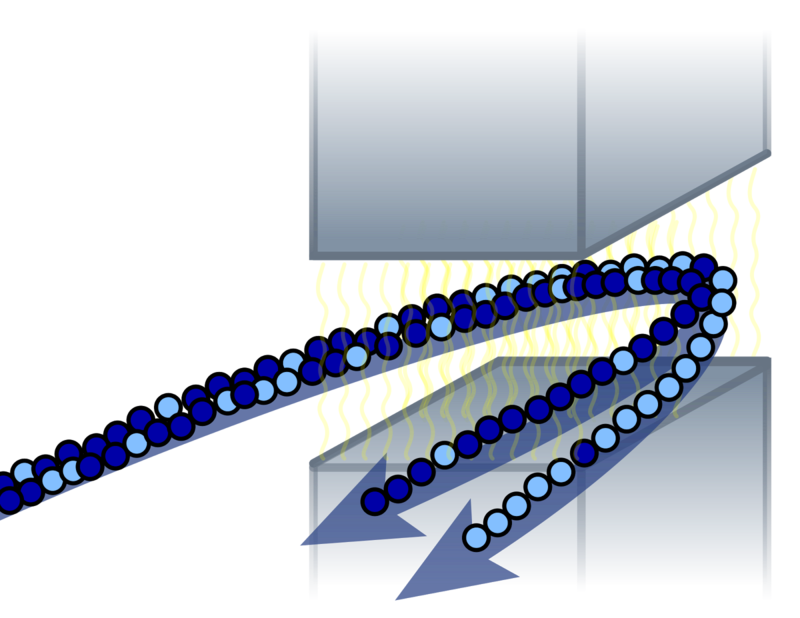 This method is used to separate magnetic substance from non-magnetic substance. Magnetic substances are the substances that can be attracted by a magnet. Examples are : iron, nickel, steel etc. Magnetic separation can be used for instance, to separate mixture of iron filling and sulphur. It is employed industrially in the process of iron ore. 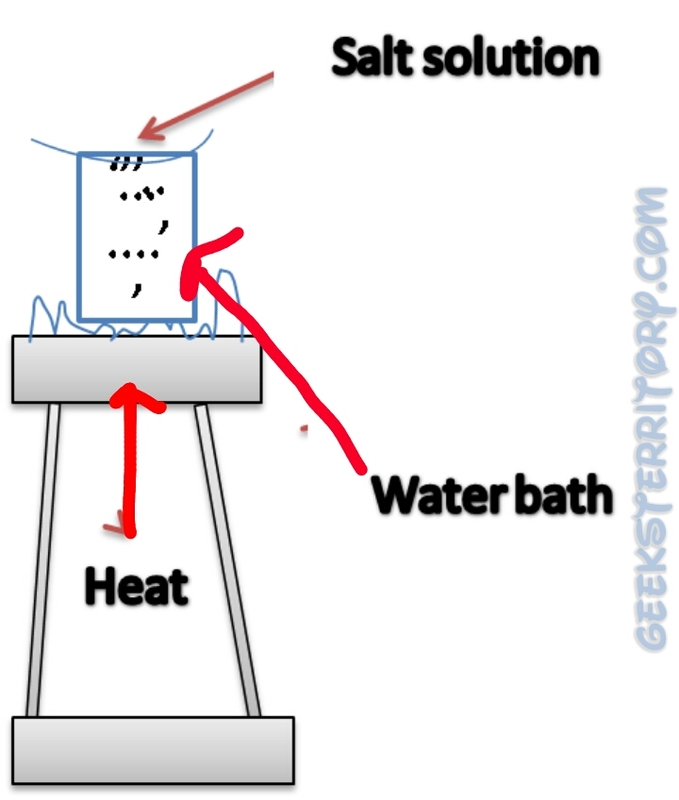 This is used to separate a solution of salt which decomposes easily on heating. The salt crystal obtain in this form is pure and usually contains water of Crystallisation. Examples are: CuSo4.5H2O , MgSo4. 7H2O , Na2CO3. 10H2O (sodium trioxocarbonate (iv) decahydrate). It is used in the production of sugar and drugs. This is used to separate a mixture of two or more solid solute that are present in the same solution at roughly equal amount. The differences in the solubility of different solutes at a particular temperature is put into an advantage. During the process, the crystals of solute come out at a particular temperature leaving behind the solute which are still within the limit of their solubility in the solution. 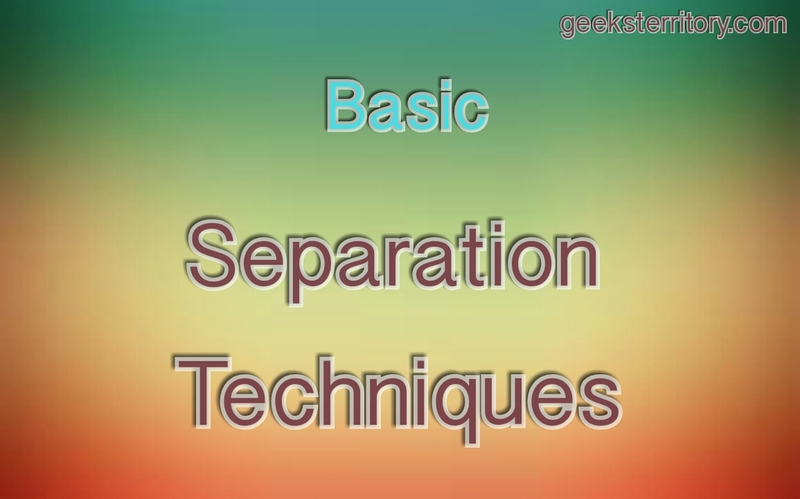 This method is used to separate a mixture of two immiscible liquids (i.e. a polar and non-polar solvent ). An example is a mixture of water and kerosene. 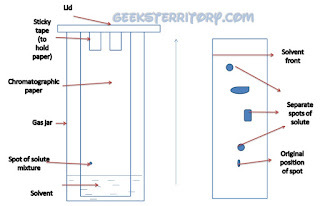 Water and kerosene is naturally an insoluble mixture, therefore forming two distinct layers. The lower denser layer is tapped off leaving behind a less dense layer when placed in the funnel. This method is used to separate coloured and colourless substances example, amino acid. The common method is ascending ascending paper chromatography. It comprises an absorbent medium which is a strip of paper. A solution of solute to be separated is spotted on one side of the paper. The paper is then dipped into a solvent in the spot. During this process, the solute to be separated mix up with the solvent at a different distance on the paper. However, the paper is removed when the solvent has moved up to 3 1/4 of the paper. 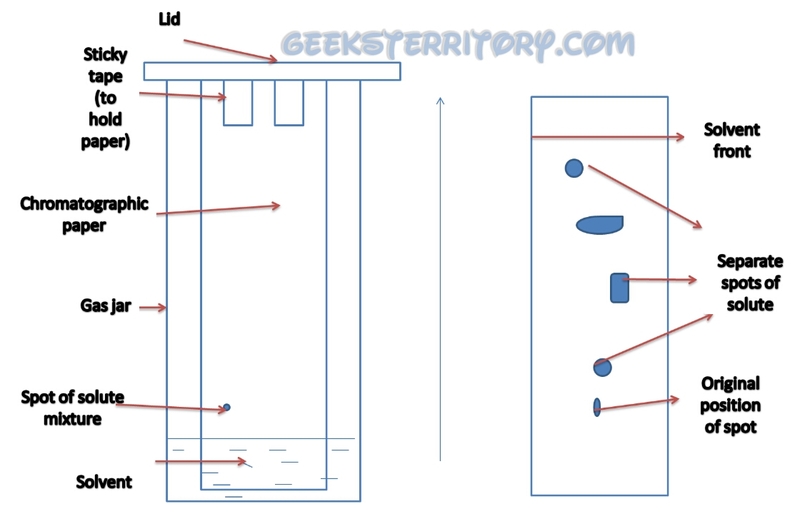 The mobile phase is the solution and stationary phase is the paper, movement is due to capillary action. It is then dried and stained with chemicals in other to know the position of each solute on the paper. Those solvents have different boiling points and would separate accordingly. You would get a clear distinct separate peaks for each solvent. Mixtures that can be separated by Gas chromatography. 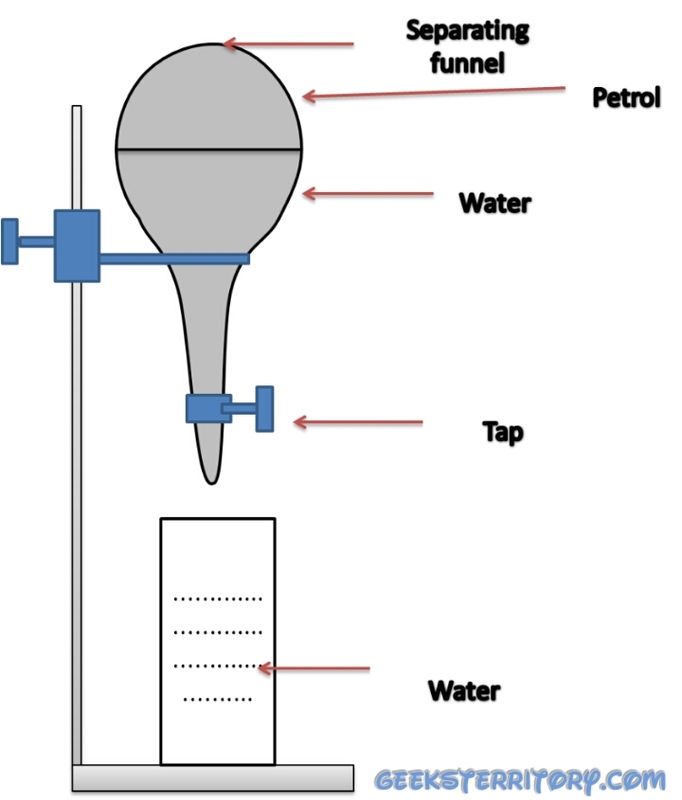 a) Liquid mixture including of Benzene, Toluene, Xylene and Trimethylbenzene. 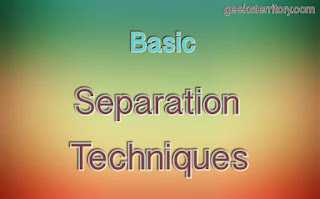 There other forms of separation such electrophoresis (separates organic molecules based on the interactions with a gel under different travel), extraction, demister ( This method is used to remove liquid from gas streams), drying (used to remove liquid from solid), sieving , stripping, adsorption (the removal of atoms, ions or molecules of gas, liquid, or dissolved solids to a porous surface) etc. Add yours in the comments box below. This is good day to talk about cars isn't it? Most people with cars complain a lot regarding the fact that a large chunk of their earnings go into repairing cars and fuelling them. It just got me thinking of how many of us go see our mechanics for the sole purpose of practising preventive maintenance on our cars. It is known that majority of car owners engage more in repairing their cars than maintaining them. Even though it's very important it can be stressful at times. For this reason I have composed some common maintenance practises your can do on your own. This should be done regularly usually twice a year. You will be doing this to prevent oil contamination. It's advisable to use fully synthetic oil which last longer and doesn't have to be changed as often under normal driving conditions. It is very advisable that you change your the oil in your transmission every thirty thousand miles to avoid major breakdowns. 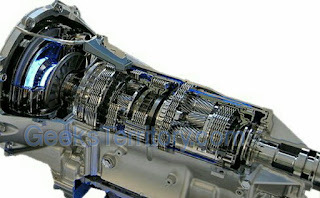 The automatic transmission system is a major part and much importance should be accredited to it. 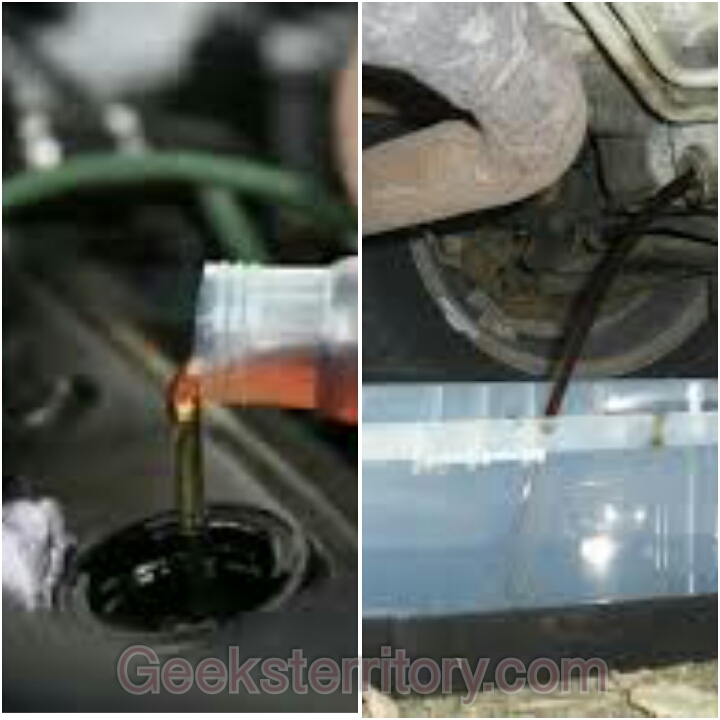 3) Change the coolant in your cooling system. (a) It can cause over heating of the engine. (b) It can clog up the tiny fins in the radiator. (c) In a modern car , it can shut out electrical sensors or the computer system. This is very much dependent on the type of coolant you use. For example, if you use a conventional antifreeze, It is advisable to change your coolant every three (3) years or every 30000miles. 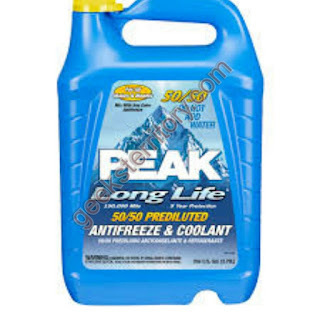 With an Extended life antifreeze, in this case, you don't have to change the coolant until after five (5) years or 150,000miles. Check it every once in a while for corrosion build up the terminal head. If there is, use a wire brush to brush it up. 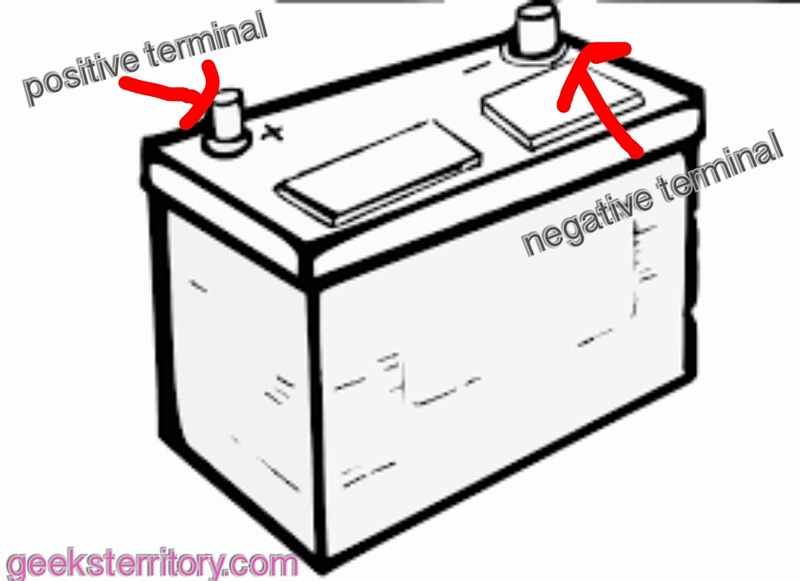 Also try using a " Battery terminal protection spray" and spay it on top of the battery terminal. Battery testing; Allow your mechanic to use his battery tester to check for battery's efficiency ones and twice a year. This is particular important for automated vehicle, as the required proper voltage for the computer system to function or else. It may destroy electrical components. The tyres of your car are also important as they serve the same function with your feet. The tyres of your cars should be taken good care of. When you notice the wheels aren't properly aligned, take it to your mechanic to do a wheel alignment. Also allow a professional to examine the wheels regularly. If you check and one on the tyres is deflated. (a) If you are changing the front wheel, make sure you place a stick/stone/rod to prevent car from moving while working. (b) Now start dismantling, unscrew your log nuts tyre iron ( it has a cross shape) or a breaker bar (for very tight nuts). (b) Lift the vehicle with the jack ( Take noticed of where place the Jack by looking underneath the car). (C) Gently take off the tyre and put in the spare one. (d) Screw back the log nuts. (e) Lower the car, then take the Jack and deflated tyre to your trunk. NOTE: Don't forget to pump up the deflated tyre , so it can serve as the spare tyre when you need It. Yeah, we have come to end of another article. Lesson here would be for you to start paying attention to your car. 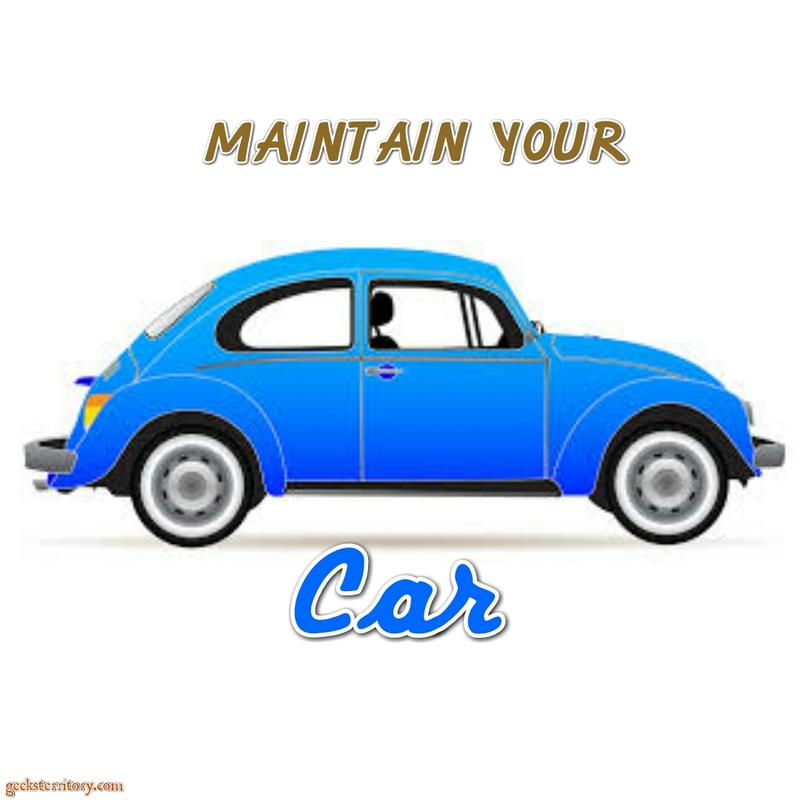 Read more on cars so you can detect signs when something is wrong. Listen for any unusual noise, check for any light prompt signals at the dashboard region and understand what all the symbols means. Oil Change and Oil Check effectively. Maintenance of horizontal sealing jaw. Maintenance of Vertical sealing jaw. I hope this was helpful. Please don't forget to share. All comments are appreciated.